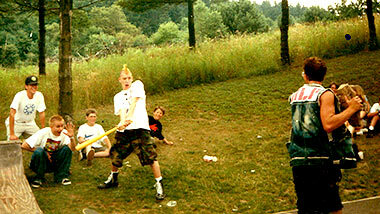 Teenage skateboarder punks play some rock baseball, plastic bat and mitless, of course. Umpire: Tom Rege, Catcher: Chris Carlington, at bat: Nick Carlisi, Pitcher on the Plate: Monk Riggidy. Yeah, holy smokatines! What big pipes you have there Popeye!